Still not an environmentally-minded quote...due to everything esle going on the US that distracts from the all-important environmental issues of today. However, I promise in the coming days I will find an environmental quote, even if I have to go back to the days of Rachel Carson! In fact, that's what I'm going to do, because some of the anti-environmental gibberish of days gone by are being used today. Imagine that! Here's today's quote from a lawyer regarding Russian medling in America's 2016 Presidential election, ones that caused the presiding judge to reprimand the attorney stating that he was "unprofessional"...but you make the call. "The Special Counsel's argument is reminiscent of Otter's famous line, 'Flounder, you can't spend your whole life worrying about your mistakes! You f(asterisk)(asterisk)ked up . . . you trusted us. Hey, make the best of it." 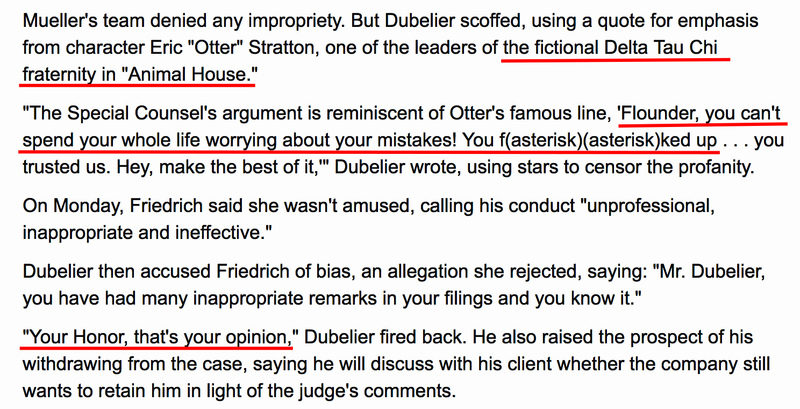 When the judge referred to his unprofessionalism, he responded with, "Your Honor, that's your opinion".